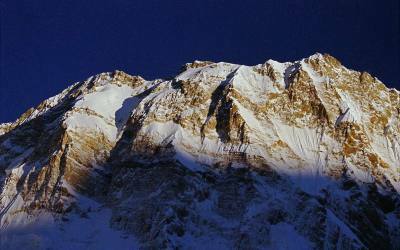 To the Northwest of Nepal lies the fascinating country of the legendry Sherpas. In this land of mountains, Pumori stands aloof and proud as if aware of its intense effect on the valley below. From the smaller summit belonging to Kalapattar to the sparking slopes of Pumori there appears to be a path that leads to the very sky. 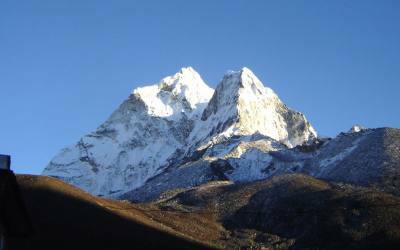 Pumori, this incredible pyramid of snow and rocks, is indeed the pride of the Solo Khumbu. 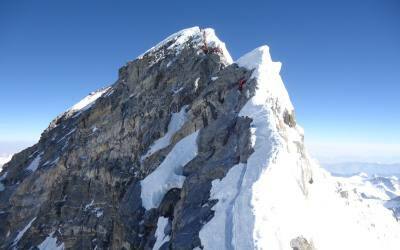 Pumori is generally considered to be technically challenging and requires climbers to be experienced as well as in faultless physical condition. 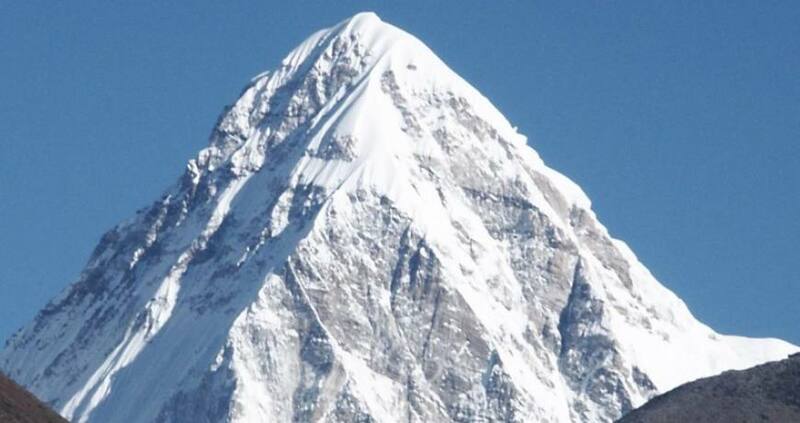 For one such climber this mountain could become the most rewarding challenger in the Himalaya. Our trek kicks off at Lukla. For the actual climb we will use the classical route which was first opened by a German -Swiss team. We climb the enormous south-east slope till the junction with the north-east ridge. This route requires the least amount of technically: but is exposed to objective dangers: an avalanche prone section and a section exposed to seracfall. 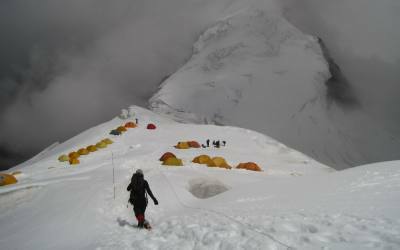 The Base Camp is at an altitude of 3500m while the advanced camp is established at an altitude of 5900m. Day 01: Arrival & Transfer to Hotel in the afternoon sightseeing around Thamel(Tourist Area) & Walking tour to Kathmandu Durbar Squire. Day 03: Kathmandu to Lukla Phakding (2,600m) - Fly to Lukla. Day 05 Namche Bazar (Rest Day )- A day to acclimatize. Provided the weather is clear, the views on the flight are stunning. As you leave the airport you have superb views of the Langtang and Jugal rangers that surround the Kathmandu Basin. You then fly over Rolwaling Himal with striking views of Gauraisankar and Menlungtse before reaching the Everest region and the airport at Lukla. The trail starts from Lukla with a gentle climb up the mountainside on the left bank of the Dudh Kosi (river). In the distance you may be able to see Nupla (5,885m), rising above the ridge. The path continues up and down along the side of the river before arriving at Phakding. Continuing from Phakding you get your first view of Thamserku (6,623m), which looms above you on the opposite side of the river. The path climbs up a terraced hillside passing through small villages and rhododendrons forest and across a number of small streams. There are many ascents and descents but the final hike up to Namche Bazaar is quite hard going with a steep path that zig zags up the hill. However, it is all worthwhile as you finally reach the top of the ridge and there are superb views of Everest (8,848m) and Lhotse (8,516m). A final short walk through pine forest takes you to Namche Bazaar, the centre of the Everest Trekking region. In the town there is an interesting Sherpa Traditional Museum from where there are fabulous views of Thamserku (6,623m), Amadablan (6,812m), Island Peak (6,160m), Lhotse (8,516m) and the top of Everest (8,848m). There are two routes to Tyangboche and we take the left fork via Khumjung at the foot of Khumbila Peak (5,761m). Khumjung Gompa possesses what is said to be the skull of a yeti. From Khumbila we descend through forest to the village of Trashinga and then down to the Dudh Khosi which can be heard thundering through the valley. After crossing the river it is a long steep climb to Tyangboche. As you reach the top, the incline gradually eases off and you finally pass through a stone gate, built by lamas, which marks the entrance to Tyangboche. 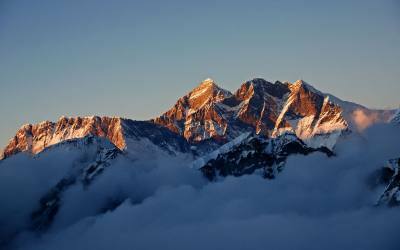 In front of you is one of the most impressive views anywhere in the Himalayas, an awe inspiring panorama of Himalayan giants: Kwangde, Tawache, Everest, Nuptse, Lhotse, Amadablam, Kategna and Thamserku. Find yourself a seat and settle down to watch the sun set over Everest ! Cross the Imja Khola and Continue through terraced fields and rolling pastures Where yaks graze to Pangboche (3,860m). Our day ends in Dingboche. An exciting day as we head towards our final destination. After lunch we will leave our bags in gorakshep and walking towards to everest base camp at the afternoon we will return back to gorakshep. Early in the morning we will climb to the Kalapattar for sunrise tour. In a clear day there are magnificent views of Everest range including close views of mountain Everest. Then walking down hills towards to lubuche. Walking through with forest and high dry sandy stone path to pongboche. We will continue to walking down hill through forest & River. After crossing suspension bridge we will start to climb up hill through forest to the edge of mong. Walking through side of river and forest to reach to Lukla. Where we spent a nights. 4 nights hotel in Kathmandu. Personal bar bill, travel insurance/International airfare. Items of personal expenses such as alcoholic drinks, cold drinks, laundry, tips etc. All the entrance fee of temple in Kathmandu.